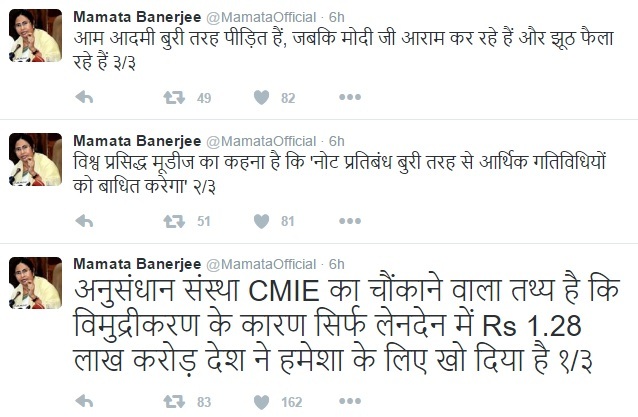 Mamata Banerjee is very active on Twitter (@MamataOfficial) and basically tweets in English and sometimes in Bangla. But she is using Hindi as well, and strategically, in order to reach a wider cross section of people on the demonetization issue which she is vehemently opposed to. 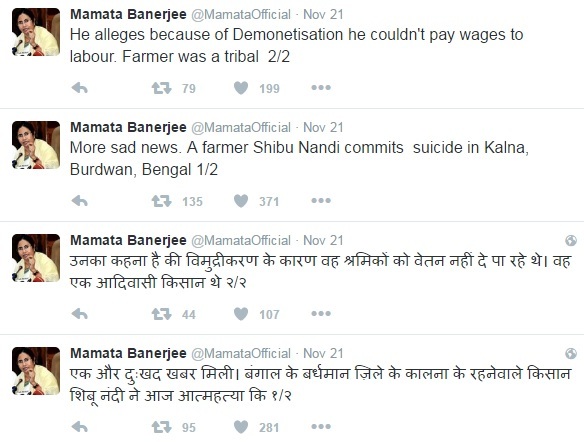 A scroll down her Twitter feed will show that increasingly most of her tweets on demonetization are in both languages. 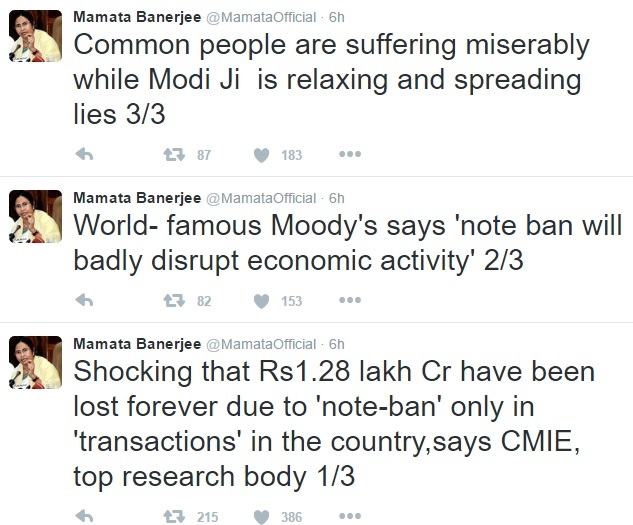 She has tried to emerge as a central figure of the anti-demonetization front and her outburst began on Twitter only when she termed the Modi government decision ‘a financial chaos and disaster let loose on the common people of India’ after Narendra Modi finished his address to the nation announcing the decision that has kept India hooked since then. 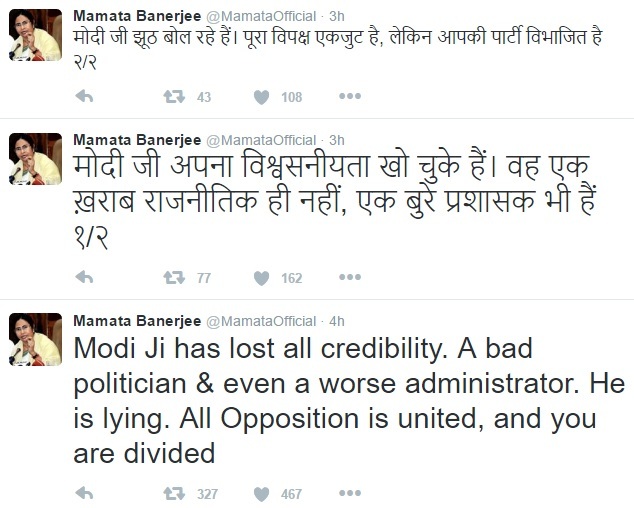 Her Hindi tweets also indicate that she is now looking for a wider canvas politically, something that the ensuing chaos in the aftermath of the demonetization drive can give her. She has hit Delhi streets and has held meetings and parleys against demonetization since the Parliament’s winter session began on November 16. 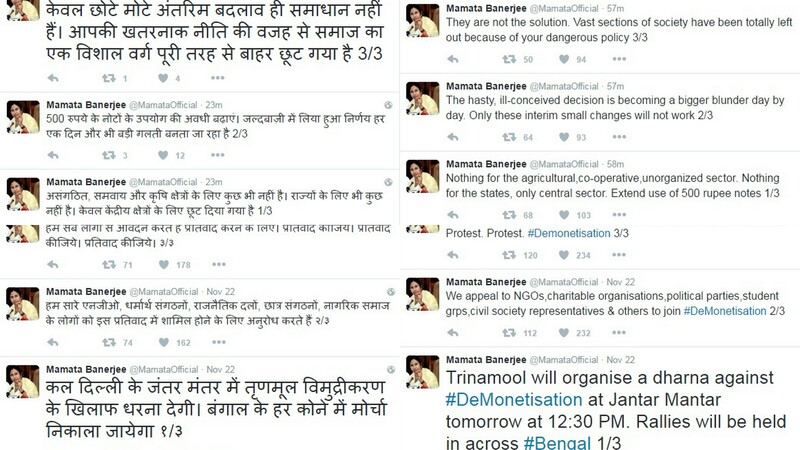 Now that the opposition parties have decided to launch a pan-India anti-demonetization protest with ‘Aakrosh Diwas’ on November 28, they all will try to mobilize masses as much as possible and Mamata’s use of Hindi to reach out and appeal to people, along with her image and streets-smart style politics of ‘Ma-Mati-Manush (Mother-Motherland-People)’ will come in handy here. Demonetization pangs have affected people across the country and speaking in a language that reaches out to the maximum number of people is certainly a logical idea. Also, now that TMC is a national level political party, speaking and tweeting in Hindi makes sense when the heart of India’s political landscape, Uttar Pradesh, a Hindi speaking state, is going to polls in the next few months. Today was basically a field days for spokespersons. They tried to cover as much length and breadth of this country as possible and they tried to speak as louder as they could so as to become audible (and visible) to media and social media eyes and ears and so on. What was put in action some days ago saw its top pitch today and will have its various notes in the days to come. The biggest of them (in stature), held big sized rallies like the one held by Narendra Modi in Saharanpur. Then there were extensions – from the ruling party – and from the opposition – selling and counter-selling achievements and allegations. And then there were propped up or spontaneous splinter entities – on airwaves – blessing or bashing the two years of the Narendra Modi government. Now, statistics tells what you want it to tell. So, Narendra Modi, his spokespersons, other leaders of his party and his supporters have plenty to tell – from social empowerment – to introducing structural changes in infrastructure – to industrial turnaround – to internal and external security – to foreign policy. Likewise, Narendra Modi and BJP’s political rivals, including Modi’s detractors, have as much in their kitty as they want to scatter – and they want to scatter it all. So, if NDA and BJP’s ministers, MPs and other leaders are busy holding meetings and rallies in different parts of countries, hard-selling their claimed achievements in these two years – the two years, that according to them, have changed India – political rivals and opposition, including Congress, Left Front, JDU, AAP and others are busy hard-selling their counterpoints – presenting point by point rebuttal of government’s claims. But the fact is – statistics doesn’t really tell the stories that pull votes in times of elections – if figures are without facts – or even if figures are with flimsy facts. We all saw how NDA’s ‘India Shining’ campaign crumbled in 2004. We saw how miserably the Manmohan Singh led UPA government failed in convincing people in 2014 Lok Sabha polls that it indeed had delivered on governance. Like Modi has directed his ministers and party members to take their achievements to people, Manmohan Singh, Sonia Gandhi and Rahul Gandhi, too, had tried. The difference is – Modi is on the job right from the first year of his government while Manmohan Singh’s government tried it as a desperate campaign measure in the face of a sky-high anti-incumbency after nine years in the office. Obviously, those statistical tales didn’t help Manmohan Singh and Congress then and the party was reduced to its lowest tally of 44 in the Lok Sabha. Narendra Modi must be having that in mind. The biggest currency that Narendra Modi has, after two years in government, is – he still has no competition at his level. He is still the most popular politician, one of the most popular prime ministers and the gap between him and others who could pose as his rival to the prime minister’s office in 2019 is comfortably wide. In fact, he is sitting at the top pretty comfortably. After two years of Narendra Modi in 7RCR, the official residence of India’s prime minister, India, still, has no political alternative to him. But then, three years is a long time in India’s political landscape. Anything can happen. Let’s see which way the political tide turns (and soars) starting with the Uttar Pradesh assembly elections early next year. ‘Bharat Mata Ki Jai’ (Hail Mother India) has finally exploded and the way the level of discourse has deteriorated, it really leaves the rationally thinking souls in a bitter taste. Today, the Maharashtra Legislative Assembly unanimously passed a resolution to suspend AIMIM MLA from Mumbai, Waris Pathan, from the House for the remaining days of the Budget session after he reiterated what his party chief Asaduddin Owaisi had said three days ago – that he will never say ‘Bharat Mata Ki Jai’. It is true that the Indian Constitution doesn’t ask anyone to chant ‘Bharat Mata Ki Jai’ to prove his/her patriotism/nationality – something rightly pointed out – first by Asaduddin Owaisi – and then by his party MLAs. He has added another contentious point to the already intensified ‘nationalism Vs anti-nationalism’ debate – as if the beef politics, the sedition row or the ‘award-wapsi’ over the tolerance Vs intolerance debate or the ‘ religious conversion or Ghar-wapsi’ episodes were not enough. The row has taken over the airwaves and has become the main news agenda of the day. And as the polls have been announced in five state assemblies, the polarization politics would do all to keep the row alive. But being a political person, and being a member of the Parliament and above all, being a people’s representative, he has to be socially and politically correct here. And he is socially and politically incorrect – literally (and not pejoratively as the phrase ‘politically correct’ has been a subject of linguistic discourse)! Yes, the fundamental duties are discretionary, voluntary in nature but that doesn’t mean we should blatantly disregard them. If Mr. Owaisi and some others don’t want to say ‘Bharat Mata Ki Jai’, it is their prerogative – but only in private – or as private members – not when you are in public life – and certainly not the way Mr. Owaisi has chosen to express his rant – while addressing a public gathering. When communication goes on mass level, no one sees the intent but the words you speak – the words that have stirred a hornet’s nest here. In order to score political advantage, he has given avenues to others engage in some votebank politics that ultimately disrupts social balance. If the Constitution gives us the fundamental right to speak our mind, it also expects us to respect others’ feelings and other thoughts – as it says – ” to promote harmony and the spirit of common brotherhood amongst all the people of India transcending religious, linguistic and regional or sectional diversities”. Mr. Owaisi and his party’s tirades on ‘Bharat Mata Ki Jai’ belie the spirit of this notion. It is not about RSS or some other outfit asking us to swear by ‘Bharat Mata Ki Jai’ , it is about our right to feel so and say so as Javed Akhtar very emphatically expressed it yesterday in the Parliament putting Asaduddin Owaisis in the doc. Asaduddin Owaisi may try to score some political mileage by uttering a cheap political expression that would certainly hurt Indians across the communities. But if Mr. Owaisi thinks he will score some brownie points politically by using such inflammable words, it is really a dangerous precedent, a new low in political discourse in the country – something that has been mostly been crass or ‘politically incorrect’ for social harmony. Well, I am again taking liberty from my self-made principles when it comes to writing – by using a tweet – from sources that usually don’t make for informed news elements. Social media feeds make for some great news stuff – but then one needs to be cautious about what to use, when to use and where to use. This tweet from the media advisor of the Aam Aadmi Party’s numero-uno and Delhi’s chief minister Arvind Kejriwal tells how far the party of ‘freelance activists and full time politicians’ has moved from its stated ideals (and principles) when it had announced (or we can say now, going by the precedent based on the political trajectory of the AAP so far, it had boasted to mislead people) to enter politics – to clean it up – to make it truly common man centric – to run it as peoples’ mission. We all know that is passé now, buried into the latest episode of the political history of India – a history where friends and foes are picked up or rejected based on their political tenability. There are numerous developments to talk about this sad demise of peoples’ hope to experiment with their political hopes. And this ‘expressivity’ by the media advisor of Arvind Kejriwal was just in line. Yesterday, he tweeted an article written on Scroll.com, a good website with basically good write-ups. It was on a day when his boss was in Bihar, sharing various stages with Nitish Kumar. Nitish Kumar is Bihar’s chief minister and is taking on the BJP led National Democratic Alliance in the upcoming Bihar assembly polls slated to be held during October-November. The BJP was the long-time partner of Nitish’s Janata Dal (United) until Nitish’s prime-ministerial ambitions led his take a different path, breaking the alliance. Political analysts say Nitish has chance to win over Bihar again, irrespective of his party’s humiliating performance during the Lok Sabha polls last year as he is credited to lead Bihar to a path that started a process to undo the ‘bad elements’ percolated everywhere during 15 years of Lalu Yadav-Rabri Devi rule – but what is going against him – is – his alliance with that Lalu Yadav and his Rashtriya Janata Dal – and it could be acidic enough to corrode his winning chances. And Arvind Kejriwal is extending his ‘moral’ and political support to this alliance. So, obviously, a propagandist party like the AAP would exploit all tools available to justify its acts – like it has done so far – without caring for public sentiments during this round of governance – trying to make Kejriwal larger than life in Delhi’s political circles with ‘grandiose and boastful ’ advertising campaigns. The article is good in presenting premises but ends up making a premise – a central one – that the written political history of India has been unjust with and biased towards Lalu Prasad – a premise that can be said unilateral and biased. 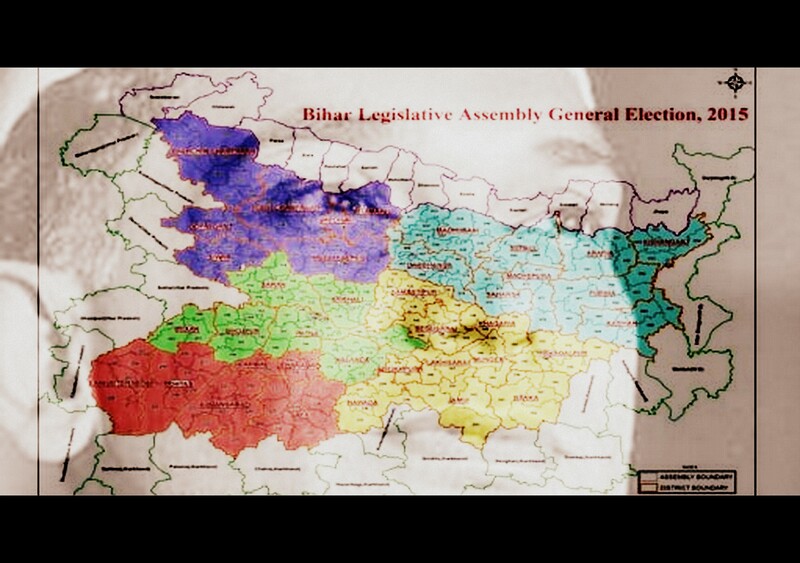 Bihar was ruined during Lalu days of governance – and the malaise was widespread, irrespective of class and caste – and Lalu’s humiliating political catharsis in Bihar’s electoral politics is a living example. The AAP’s mouth organs speak in unilateral voice and see in a straight direction – as every political party does. This tweet and every other communication element is just doing the same – like this media advisor had adopted a practiced (and expected) silence on a question related to Swati Maliwal’s appointment as the chief of Delhi Commission of Women. Now, as the goings say, this seems to the AAP’s real political character – like any other political party of India. It’s a new beginning for India – in its new pursuit of promoting a confident identity – using its age-old culture that has assimilated different incoming shades and has survived for centuries and is still going strong. Yoga is a gift from India to the world. It is an art, a science, and a transcendental philosophy to realize our spiritual quotient. And in India, if we leave politics aside, its acceptability goes beyond religions. And the annual International Day of Yoga (IDY), beginning this year today, on June 21, the Summer Solstice day that brings to us the longest day of the year (Summer Solstice day can fall on any day between June 20 to 22 but June 21 is common), should be seen in this context. There will be debates on why ‘Narendra Modi’ proposed June 21. Reasons range from scientific like the Summer Solstice to sociological like celebrations associated with the day to mythological like Lord Shiva taking note of the seven people in meditation for 84 years to seek him as their ‘Yoga Guru’ (as Sadhguru Jaggi Vasudev writes) to political like June 21 being the birth anniversary of the Rashtriya Swayamsevak Sangh (RSS) founder Keshav Baliram Hedgewar but let’s not go into that. Yes, Yoga is a healing and wellness gift to the world from India – from ancient times. And it has continued to be so, spreading throughout the world, through travelers coming to India, through Indian texts and religions in other civilizations, like Buddhism spreading in many parts of the world, through cultural exports like art, sculpture and tradition and through linguistic influences, like influence of Sanskrit can be found in languages and scriptures of countries which shared historical trade routes with India, like Swami Vivekananda found during his voyage to the United States of America in the last decade of the 19th Century. It was Swami Vivekananda who introduced Yoga to the Western world in an organized way. He gave shape to an un-thought process that had started with European colonization of India. Yoga has been there since ages. And its spread throughout the world has taken place gradually, in every age, based on its merits, more so in 19th and 20th Centuries. And it is continued even today with India being the leading light for gurus and teachers of Yoga worldwide. Sages and ascetics developed the art in India and so naturally, the spiritual elements of Yoga have religious texts of Hinduism of the day or whatever we want to call (the religion). It was natural when the ascetics meditated enchanting names of deities (we follow them; we find in our religious texts) and taught their followers to do so. Doing so was practical and not religious. If religion had anything to do with it, it was about the God, the common link between ascetics, sages and other people. God was the central and common point of concentration of all. And it has remained so. And that pragmatism is applicable across religions – in India, and outside India. Yoga is an art that scientifically improves the mind-body balance of a person and, if willing, takes him to the higher realms of spirituality. Practicing it is not a must but a lifestyle with Yoga as its inseparable element brings qualitative changes in practitioners. And a large-scale adoption has potential to create healthier societies. Obviously, thinking that Yoga alone can do it will be daydreaming and more so in a society like India where multiple problems like poverty, quality illiteracy and poor civic amenities still beset societies across the country. To address the issue here, we need a political willpower to work on all these issues holistically. But it doesn’t belittle on the factual benefits of Yoga – physical, meditational and spiritual – something that has taken it to beyond India – in every part of the world. What Narendra Modi did should have been done by the political dispensation of India much earlier. It had to claim to be the origin-place of a legacy that was already global in appeal and outreach. But every political dispensation in India had failed to do so, so far. We cannot say if they even thought about it. And Narendra Modi did it. He realized the potential of projecting soft power globally by claiming this legacy. We may debate the quality and outcome of the governance so far by the government of Narendra Modi but we need to give him the credit for IDY. India is the world’s largest democracy. It is the fastest growing economy of the world. It is the third biggest economy of the world in terms ‘purchasing power parity (PPP)’. Harvard University study report says India’s middle class will be the largest one in the world by 2030. The country is among the top military powers of the world with many firsts to its space programme. If politically handled well, the country is slated to go up in the world order on human parameters as well. That requires efficient governance not just on core issue but on other important issues as well – like projecting cultural strength of India and using soft power as a policy tool to further the nation’s interests. An international day for Yoga established by the United Nations and endorsed by its member countries including the Muslim ones on a proposal moved by Narendra Modi is a positive step towards that. Narendra Modi proposed IDY in September 2014. The United National General Assembly declared it in December 2014. And we are celebrating the first IDY today – all in a span of nine months. The US has been using ‘soft power’ projections for decades and is quite successful there. If America is seen the world over as the right place for democratic values in a free and just society, we need to give due credit to its soft power projections as well. We all see that theme in Hollywood films – an industry with global export scale – even to the countries where dictators run amok. Russia was a natural villain in many big productions during the Cold-War years. In recent times, North Korea and China (though to a lesser extent) have also taken that place. And China is trying its hands on projecting its soft power too though it has not much to talk about as the country is one of most repressive societies where one is free as long as one toes the government line there. That leaves China to promote its culture as the selling point, sans any political element. Projections of Chinese martial art, Chinese culture in ancient, medieval and modern times and China’s resilience during its occupation by Japan have been the main elements of this soft power projection. India fares much better than China in having acceptable elements of soft power and the country should use such elements as a policy tools to enhance its global image like it has done with IDY. Yes, there will be controversies and criticisms and some loopholes in the execution of the developments associated with the projections, but sending the larger message will subside all that. The world celebrated this global day today – from India to America – from many European countries to Latin American countries – from Asia to Africa – from predominantly Muslim countries to the democracies having predominantly Christian population. And India led the show, led the way. The day was celebrated on a wide scale in India and abroad. Government wings including its forces and foreign missions were preparing for the day. Ministers and teachers were sent in many countries to organize events there. Spiritual and religious guru Sri Sri Ravishankar and Minister of External Affairs Sushma Swaraj led the event at the United Nations in Washington. And in India, Prime Minister Narendra Modi culminated his ‘daily Yoga tutorial through videos’ with a grand event at Rajpath in Delhi where more that 35000 people participated. Guinness says two world records were made today – 35,985 people made the world’s largest Yoga class in Delhi – and they were of record 84 nationalities. And the right images from India met with the right images from the world over. Many in the global media covered IDY naming India as the country behind the move. June 21 is also the birth anniversary of Jean-Paul Sartre, the French philosopher Existentialism is synonymous with. Individual existence is central to Existentialism and social developments are seen from the perspectives of human subjects. Hope policymakers in India also work on the core issues related to the human subjects – alleviating poverty, improving education and healthcare, ensuring Constitutional rights and removing corruption – in addition to the successful public relations exercises like the International Yoga Day. From a declared terrorist to a spontaneous anti-hero! From a declared religious militant to a symbol of anti-establishment protests! The imagery that lasted for centuries, some 370 years –long enough for system and people to go routine and indifferent to the reason with which it had started – after all, time wears off reasons, interpretations and relevance of any incident to customize it in the context of ‘now’ – has been made irrelevant in three decades. The imagery that started taking birth in early 1980s with a character of a fictional world, has become the most adopted placard of anti-government and anti-system protests the world over in just three decades. That tells us the power of communication and the media it rides. Before the movie ‘V for Vendetta’ which had a wide release in 2006, Guy Fawkes was not known worldwide. Same thing can be said about his mask, or the mask designed in his name. Even in Britain, the country of the Gunpowder Plot of 1605 and the country of Guy Fawkes, he was being forgotten, even if the plot had become synonymous with his name. People preferred Halloween over it and people preferred calling November 5 as Bonfire Night and not ‘Guy Fawkes Night’. He was resurrected as an anarchist and an anti-hero in a comic book series, ‘V for Vendetta’ on a fictional dystopian Britain. 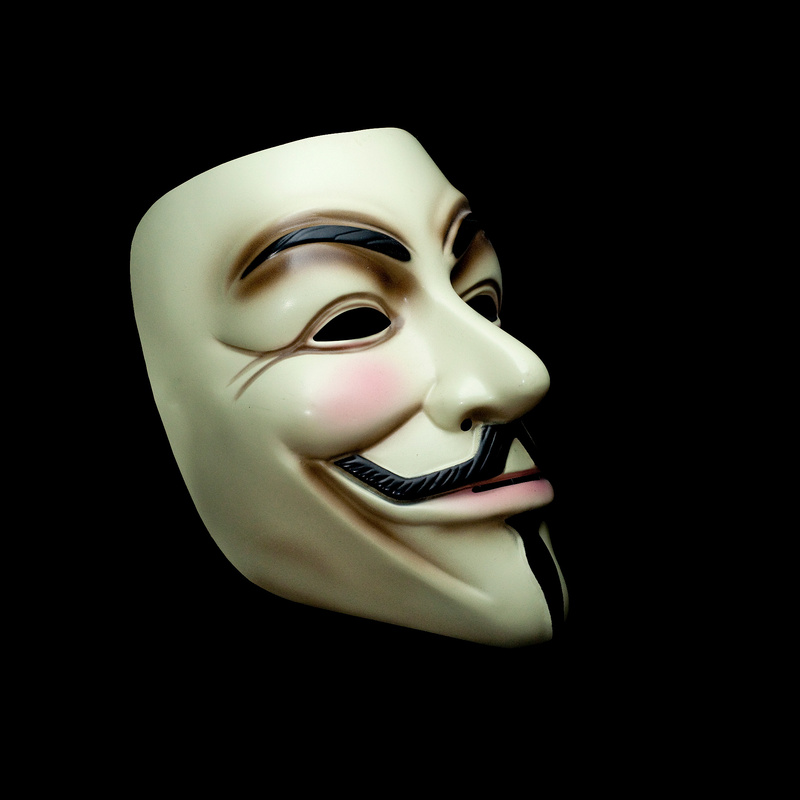 The main protagonist of the fictional world, ‘V’, was dressed like Guy Fawkes wearing a Guy Fawkes mask. The series continued for several years. ‘V for Vendetta’ was also released as a graphical novel. The 2006 movie epitomized the written work behind it. Though it had many changes from the source material, it can be said it took out Guy Fawkes and his mask out of Britain. With the launch of the movie, the Guy Fawkes’ journey, from a terrorist to an anti-hero, was prepared for a global outreach. And it came in 2008 when the ‘hacktivist collective Anonymous’ adopted Guy Fawkes mask in its protests against the Church of Scientology. Since then, it is all over. Since then, the mask has been adopted as the protest symbol the world over. Its outreach is clear from the fact that it is banned in Middle East countries like Bahrain, UAE and Saudi Arabia. And it is also banned in Canada in ‘extreme circumstances’. Films are a powerful medium to take an image to the global audience to change and build perceptions. The US has been doing it for years. And Guy Fawkes’ metamorphosis though the Guy Fawkes Mask once again reiterates it.